March Madness is the time when NBA fans often begin paying more attention to college players and prospects who could become impact players at the next level. The attention has been squarely on Duke phenom Zion Williamson, and, to a lesser extent, a few of his freshman teammates, while some will see Murray State sensation Ja Morant for the first time. But there are other players who will open some eyes or at least remind observers of their skill in the coming weeks. Yahoo Sports talked to several scouts and executives about players who fit that criteria and may become household names. Some could elevate to the lottery, while some could cement themselves as solid draft picks. White is certainly no hidden gem, playing for a top school with tradition. Some scouts believe he’s a combo guard, while others call him a scoring point guard. Either way, he has the potential to be explosive — in the mold of John Wall with his quickness or De’Aaron Fox, although he’s not as polished as Fox was at Kentucky. Shayok is the player with the most tournament experience, dating to his days at Virginia. But he made a leap in his first year playing for the Cyclones, doubling his scoring output to 18.6 points per game and adding to his reputation as a good defensive player. At 23 years old, he’s certainly older than most prospects, but that contributes to his savvy in big games. Scouts have compared him to Luol Deng, who also attended Blair Academy in New Jersey before going to Duke for one season. Virginia doesn’t play an entertaining brand of ball, but Hunter is a pro prospect in a number of ways. An efficient scorer averaging 15.1 points on just 10 shots, he’s developed into a catch-and-shoot option while maintaining defensive intensity for a team that demands it. He can guard everyone from point guards to power forwards. 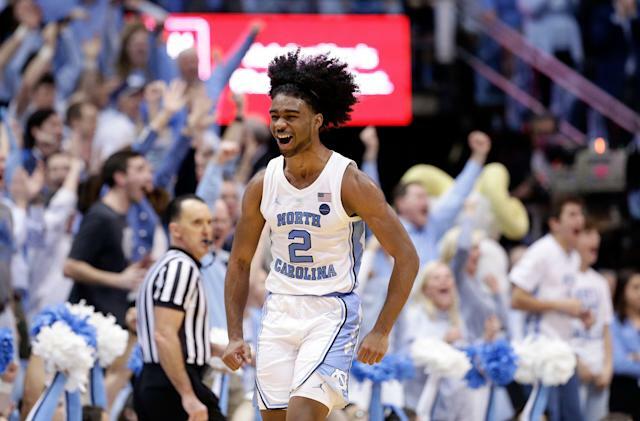 If that sounds like he could be a poor man’s Kawhi Leonard, multiple scouts told Yahoo Sports that’s who he reminds them of, making him a likely mid-lottery pick in June. Brazdeikis is an intriguing prospect who has the personality to make a star should Michigan make another run to the Final Four. He’s athletic, long, a dead-eye shooter and plays with an edge. He seems taller than 6-foot-7 and will have to prove some interior toughness. Scouts who believe he’s a one-and-done see some Manu Ginobili in how he plays, believing he’ll be hard to contain in the open floor. Thybulle isn’t average double figures in scoring as he did the last two years, and his 3-point shooting has declined the last three years (31 percent this season). But there’s something about him that makes this Washington team go because he’s one of the country’s best defenders (3.4 steals per game). His aggressiveness and willingness to defend is rare to see, and scouts believe there’s a place for him in the NBA. They don’t want to miss out on the future just because he doesn’t fit a traditional mold. Could he be a smaller, less vulgar version of Draymond Green? More players to keep an eye on: Rui Hachumara, Gonzaga; Admiral Schoefield, Tennessee; Grant Williams, Tennessee; Cameron Johnson, North Carolina; Cassius Winston, Michigan State; Corey Davis Jr., Houston; Jordan Nwora, Louisville.